No fewer than seventeen cool magnet tricks, from the irritatingly productive Evil Mad Scientists (I note that they favourited this...). I've done only a few of these "tricks" - many of them are actually more in the "handy hints" department - myself. I've made homopolar motors, and done a bit of sculpting, and the big scary truncated-pyramid magnet from this old piece is our fridge-pen holder; if a pen has nothing ferromagnetic in it, we just tape a paper clip onto it. I've also got a length of aluminium tubing and a slab of copper for eddy-current braking demos. The EMSL piece ends with a warning to keep magnets away from your laptop's hard drive, if you're seeing if you can put the computer to sleep with the lid open by putting a magnet on the embedded switch. This is a fair warning; a decent-sized modern rare-earth magnet might indeed be able to damage data on a laptop drive. But the emphasis is still on the "might", because even the scant centimetre of aluminium and plastic between a laptop drive platter and the outside world is likely to keep magnets far enough away that any not-dangerous-to-humans NIB (neodymium-iron-boron) magnet won't be able to hurt it. The magstripe on a modern credit card has a coercivity similar to that of a hard-drive platter, and you definitely can wreck a card magstripe with a small rare-earth magnet - but the magnet can touch the magstripe, while a drive platter is inside a casing, and the casing is usually inside a computer. And, roughly speaking, the intensity of a magnetic field decreases with the cube of the distance from the centre of the magnet. 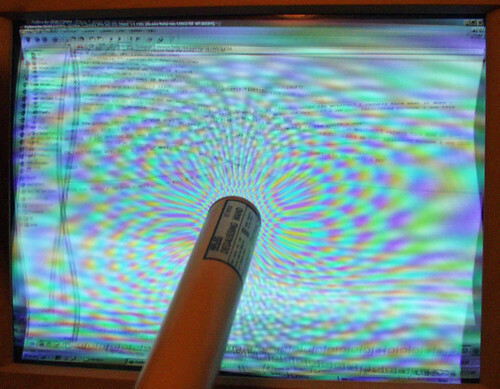 Generally speaking, you don't have to be too worried about playing with magnets near your PC. Especially now that you probably have an LCD monitor, not a magnet-sensitive CRT that'll need degaussing if you bring a magnet too close. Oh, look! Another chance for me to deploy my cool picture of a monitor being degaussed! If a shadow mask or aperture grille gets distorted that badly (usually by physical mistreatment of the monitor, not by magnets), it's unlikely to be fixable. The monitor will still work, but it'll now have permanent weird coloured blotches. At last, a use for old CRTs you can't give away, but also can't bear to leave on the footpath: Youtube hits! It's not really a great idea to do that to a CRT with magnets, because it can cause the tube to produce X-rays. How is putting a magnet near the screen going to affect the monitor's X-ray output? You get bremsstrahlung when the electron beam hits the phosphors (and shadow mask) whether there's a magnet there or not; the very gentle bending of electron trajectories by a magnet would produce radio, if anything. Bending the shadow mask is an interesting explanation - when I was a kid, my father waved a monstrous old magnetron magnet around in front of our color TV, and everything had funny colors forever after in spite of repeated degaussings. But is the shadow mask actually ferromagnetic? I remember taking a magnet to a floppy disk (back in the day) to see just exactly how sensitive they were. I ended up rubbing the magnet (not a rare earth magnet, granted) around on the bare surface of the disk before I saw any effect at all. Disks are remarkably resistant to magnets. Way cool! I'm gonna track down a black-an'-white screen now. Note that a green or amber monitor from days of yore may only have some weird connector that nothing works with today. But if it's got an RCA socket - which an Apple II green-screen will have - you should be able to plug it into anything with a composite video output. I *have* a 1084S sitting in the top of my wardrobe, specifically waiting for the day when someone wants a video editing preview monitor. Sadly, it's 2009 and the day has probably passed (if anyone wants it...). And I do know the difference between the 1084S and 1084M. Funnily enough, it's got nothing to do with video! Hand up. I used both a 1084 (no S) and a 1702 (U.S.S. Enterprise plus one?) with a VCR (first a top-loading VHS, then a SuperBeta HiFi) for a tuner as makeshift TV sets back in college. And this was in the late '90s! I did use a old green-screen monitor as a second display for a while. The cheap video card I had could only do its second output via composite or something like that. It worked great as a terminal, and wasn't that bad for movies (if you could get over the green). I initially thought it was the one that had the power supply in it, but that was Amstrad, of course. Back when Alan Sugar had GOOD ideas, instead of stupid email boxes and reality tv shows. So, what's the difference, then? Th'internet is unhelpful on the subject. >Disks are remarkably resistant to magnets. You can certainly corrupt a HDD-based ipod with about $2 worth of rare-earth magnets. I know this because, erm, a friend did it once. > So, what's the difference, then? The 1084S-for-Stereo had two speakers; the 1084M-for-Mono had one. Like my old Daewoo, that had a BUTTON for airconditioning (that lit up and everything), but no actual aircon. To be fair, it's a Daewoo. I recently stumbled upon some videos showing some really clever sculptures you can make with tiny spherical magnets, and I eventually tracked them back to http://www.theneocube.com . It's a bit strange calling their product "a cube", when it's actually 216 magnets stuck together in a 6x6x6 cube, but whatever. $30 US seems like a pretty good price for what you get... anyone know a comparable price in/shipped to Australia? A friend of mine has one of those. The parts have a good chance of disappearing on their own, never mind with a child around. They seem to turn back up, though.